VOL. I NO. 31 REG. NO. L5015 DELHI, THURSDAY APRIL 15, 1943. U.S. 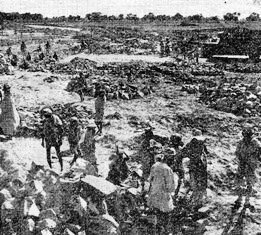 BOMBER BASE IN INDIA - Most of the suspected Japanese base headquarters at Toungoo, Burma, was wiped off the map April 4 by United States heavy bombers which blanketed fully two-thirds of the targets area with tons of explosives. Many fires were started and one was so large it was visible 20 to 25 miles away. Americans' craftiness in plotting the course to the target enabled them to catch the Japs completely off guard. Heavy opposition was expected but no enemy fighters and no ack-ack fire appeared. All of the attacking bombers returned safely. 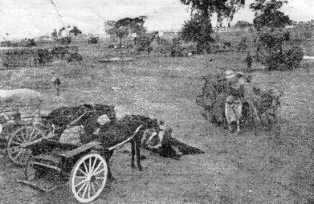 Toungoo, halfway between Rangoon and Mandalay on the Burma Railway, has always been important to the Japs but new military construction indicated the importance greatly increasing. 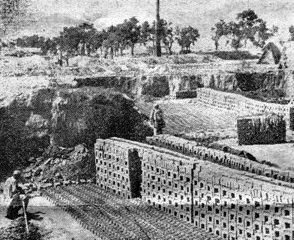 The Americans waited until military area work was completed, then blasted to bits in a few seconds which took thousands of coolies many weeks to build. smoke and flames popped out like giant hives over the area about 2,100 feet wide and 4,800 feet long. Lt. Raymond Disher, piloting one bomber, said, "We thought we would get a hot reception but not even one puff of ack-ack turned up. If there is anything left of that place, I'll be surprised." Disher knows first hand about hot receptions. Recently his plane and three others were jumped by twelve Zeros over Burma. The Americans got away with only a few holes in their planes. PASS THE PINS ! Fellas, this is Wanda - Wanda Stephenson, who should be in for some consideration as a flower in your pin-up garden. Wanda, an even six feet tall, is dancing in a new movie and she's reputed to have the most beautiful long legs in Hollywood. COMMERCIAL AIR BASE IN NORTHEASTERN INDIA - Hail-stones the size of baseballs ripping holes in the metal-skinned airliner, powerful drafts driving a plane up and down thousands of feet per minute, wings flapping four and five feet in the violent turbulence - These are pre-monsoon conditions encountered flying "The Hump" as described by soldiers of fortune flying Chinese commercial liners to China with supplies from America. For 14 years these pilots, belonging to what Chinese call "the space machine family," have been flying the toughest air-route in the world, over the roughest country, with the fewest airfields and the scantiest equipment. During the past five years they have been subject to the hazards of Jap planes. Today this toughness has reached its apex in the India-China route, which starting from Calcutta, must cross the Himalaya "foothills" at 16-18,000 feet in a hop described by every flier who has ever flown it as the hardest flying he has ever experienced. Capt. Alex K. Gingiss, Chicago, who arrived in India to fly commercially six months ago after more than a year in England as a member of the Air Transport Auxiliary RAF Ferry Command, stepped from his twin-motored transport after returning from his daily round trip from China, looking like a Monday-after hangover. "I've aged 50 years and am a nervous wreck." Then pointing at his battered plane he continued, "look at that wreck." Doubling his fist, he said, "hail this big did that. It knocked off my radio loop, broke my landing lights, cracked my window panels, dented the wings and punched holes in the tail. I've flown all over the United States and Britain but I've never seen anything like the weather in this part of the world. "Hail is not all. Once I was cruising along at about 15,000 feet and almost before you could think a powerful draft carried me to 23,000 feet with the controls back to the limit. Another time I hit air so turbulent my wings flapped as much as four to five feet placing a terrific strain on the plane. Then to cap it off a down draft cut recorded air speed to 35 miles per hour and left me skimming mountain and tree tops hardly able to control my plane. How I ever got out of that alive beats me." Gingiss and other regulars are itching for the early arrival of summer which will mean the advent of heavy rains and lessening of icing, hail, and strong winds which have harassed planes during the past months. Clouds also offer protection from Jap planes. Capt. Joseph Genovese, 31, Brooklyn, told me "a terrific down draft hit me over "The Hump" forcing my load loose from the ropes. the freight hit the roof and almost instantaneously we got caught in an up-draft and the load boomed down, breaking up the floor boards of the fuselage. Boy, what a jolt that was." Not all pilots have been as lucky as Gingiss and Genovese. Several just never arrived. Yet despite routes and enormous handicaps these soldiers of fortune are daily maintaining a commercial airlink with China as distinguished from the military effort. FLYING AMBULANCE TRAINING NURSES PREPARE FOR AIR DUTY Dressed in winter flying suits (left), two members of a U.S. Army Nurse Corps evacuation group are about to take off on a training mission in the States. A member (center) of the first graduating class of flying nurses demonstrates blood transfusion aboard an ambulance plane. During graduation exercises, flying nurses (right) show how to put "casualties" aboard an ambulance plane. Spellman Plans Visit to C.B.I. LONDON - The Most Rev. Francis J. Spellman, Archbishop of New York and Military Vicar for United States Armed Forces, said that he plans to visit India and China before returning to the United States. Archbishop Spellman, who has already visited U.S. forces in North Africa and England, said that he hopes to offer an Easter Sunday mass in Jerusalem. 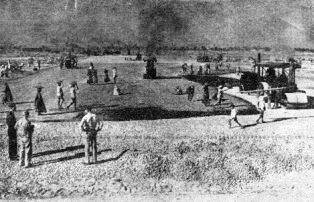 INDIA AIR DEPOT - The grand day finally arrived, and our new service club, "The Hangar," opened to the applause of thousands (well, maybe hundreds). 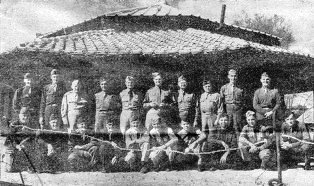 The boys of the Air Depot dropped everything to crowd in to see and talk about their new recreation center, built by the Army and furnished and run by the American Red Cross. Decorated with an eye toward rivaling, or even topping, that magnificent establishment at New Delhi where the boys of "Per Diem Hill" relax after a hard day's struggle with their typewriters, the club is really a beautiful place, boasting some very snazzy furniture, including lounges, writing desks, radios, pool table, ping pong tables, etc. 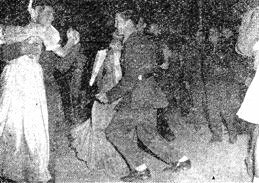 Other decorations (transient) were the eye-filling lassies who made the dance, held from 9 to 12 in the evening, a swell time for everybody. The girls came from the Lady Lyall, Thomason and Combined Indian and Military hospitals, the Jesus and Mary Convent, and the Colleges of St. George, St. Patrick and St. Peter's. Also present were girls from the station WAAC (India) unit, the Depot and - local SOS Hq., and 10th AF and SOS Hq. at New Delhi. Thanks a lot, girls, we certainly did appreciate your company, and puh-lease come back again. We need you. Our morale, you know. Praise is also due the "Jive-Bombers" who gave out with some toe-tickling rhythm for the evening frolic. Among other items on the debit side was the service club restaurant, presided over by Chef Jack Bell, who did a crushing business. The title, "The Hangar," was originated by Pfc. 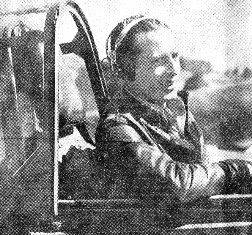 Francis Fee of one of the Depot Supply squadrons. We had an unexpected honor during the afternoon when Lt. Gen. Joseph Stilwell, CBI Theater commander, dropped in to look the club over. HQS., INDIA AIR TASK FORCE - Physiques long immersed in the desuetude of desk life and fingers that fit only typewriter keys falter and fumble as baseball, the American's favorite game, brings "strength-through-joy" to this city headquarters. Nightly sessions, with an attendance of zero early in the month, grow more popular as the month advances and purses exhale audibly. Just before payday, the broad grass playing field out back looks like the Yankees' training camp at St. Pete, with S/Sgt. Bob (Fireball) Kuhnheim likely to be out on the mound serving them up for Sgt. "Big Shorty" Hoekstra, who batters the ball with all his six feet; five inches and proportionate displacement. Hoekstra, a photo technician, is a valuable man to the Army, but then he has to be, or the Quartermaster would refuse to maintain him, no mean chore for the best set-up supply system. 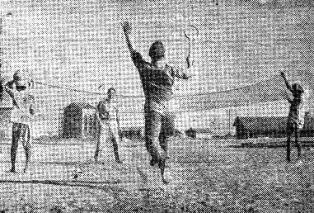 Ample sports equipment which arrived recently in the Special Services treasure chest assortment for unrecreationed troops has brought about this outbreak of athletics. Slight inconveniences are the roughness of the infield, where would-be Joe Gordons who get in front of the hot ones usually field them with their faces, and the proximity in short right field of the new mess hall's tiled roof, which is currently taking a worse beating than Myitinge Bridge. ALLIED HQ., NORTH AFRICA - A Senegalese soldier shot two German parachute troopers who claimed they were Americans. He explained to his French commanding officer: "I knew they were not Americans because they did not have a jeep." was more welcome than a slush report from your best girl in the States. Lt. Col. Walter Simpson, watching the avid doggies unpacking the radio and phonograph, making tentative swings with badminton rackets, and browsing hastily through the excellent assortment of vest pocket books, called it "more fun than Christmas morning." The ceaseless man-vs.-mosquito battle entered a new phase on this front last week with the arrival of formidable pressure spray guns, consisting of cylindrical air tank, connecting hose, and glass bottle with atomizer head, the whole easily carried by three men. You simply pump up the tank until you're exhausted and direct stream of insect spray at the "victim." The mosquitoes, for their part, appeared to gulp down the mixture, thrive, and grow meaner. At week's end disgruntled soldiers had returned to the "clap hands" or "give 'em a cuff in da chops" methods of extermination. The mills of the gods ground slowly and Kenneth E. Berryhill was receiving congratulations and answering the telephone as "Captain" after the good news arrived recently. A couple of weeks ago I told you in a letter that censorship regulations won't permit us to send you pictures of Army life in this Theater, so the Roundup is doing it for us. These pictures were taken at the India Air Depot, where I'm stationed, by Bill Vandivert, a war photographer for LIFE magazine. They've been approved by the censor and can tell you more about what we're doing here than a dozen of my letters. There'll be other pictures of U.S. Army activities in China and India - maybe other places, too - in later issues of the Roundup. This place is really big. Herds of sheep, belonging to people of five villages who used to occupy the grounds, graze without interfering with planes over a mile away. These cows pull our water out of a well so it can be pumped into this tower. Our water purification unit is a hard-working bunch. Indians, who form the 10-man labor teams, line up on the parade grounds for pay and prizes for two best monthly teams. They say they can work better if they're furnished cotton gloves, which they get. These officers are the Depot's key men. The commanding officer is Col. John L. M. des Islets (sixth from left, standing). Depot is one of the largest of its kind outside the U.S. The building is Headquarters. The old and the new. 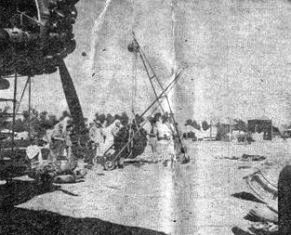 A bhishti waters the dusty ground in front of a testing block for fighter plane engines. Water is carried in goat skin and has been carried this way for many centuries. M/Sgt. Arthur Davis is in charge of all supply warehouses here. A veteran of 28 years in the Army, Davis has more than 40,000 items under his supervision. Both old and new kinds of transportation are in use here. 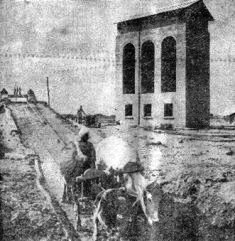 Oxcarts, like the one at right, are used to haul gasoline to pumps all over the area. There are buses here, too. Bazaar streets in the town are out of bounds and only the M.P. 's are allowed to be there. Water buffalo like this are common sights in the streets. This scene is typical of an Indian bazaar. Prices here too, are very high. A bunch of badminton sets and other athletic equipment came, so these fellows hired a couple of coolies to hold the net while they tried out the equipment. The Indians couldn't understand to drop the net to take care of close shots. There are more Indians working at the Depot than there are American soldiers. These coolies carried foundation rock into place for the taxi ramps leading to revetments. More coolies go about the work of metaling a road. First big foundation rock, then crushed rock, tar and more stones. Whole families, including women, carry building materials on their heads. Capt. John Clegg, who's in charge of civilian personnel, listens to "roughneck" pleading to be allowed to join the American Army. 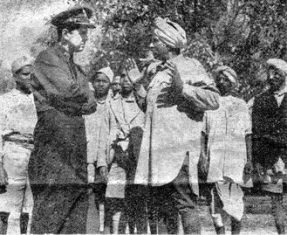 "Roughneck," who served in the Indian Army for about 30 years and now heads one of the labor teams, periodically brings his men up to Clegg to enlist. There have been as many as eight temporary villages on the depot grounds at once. This is a brickmakers' village. All the bricks used at the Depot are made here. Other villages supply the different building materials needed. Villages move with construction. Until the hangars were built, all airplane repair work took place right out in the open, and there were only a few tents for shelter. 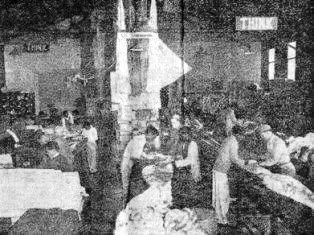 Here's the interior of the parachute department, where Indians efficiently and carefully pack and repair parachutes. This work must be done exactly right, or it might cost lives. 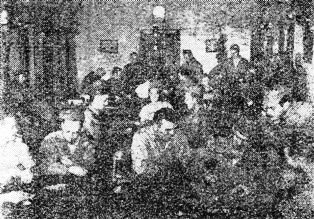 The day rooms in various barracks are popular places at night. When this picture was taken, electricity hadn't been put in yet, so we played checkers, cards and other games by lantern light. There's stuff to read here, too. At dances, held in town on Friday and Saturday nights, we really come into our own. An American soldier orchestra, "Jive Bombers" specializes in swing music and the boys really get off plenty of that fancy jitter stuff. That jive music is tiring and sometimes the fellows have to sit one out. The stuff in the bottle is a locally-made adaptation of soda pop. The furnishings are plain but with the music and the girls, that's all we need. After a day's work and a night's fun, then a good night's sleep. We are quartered in the Headquarters Squadron barracks. There are no springs, but you soon get used to the beds, which are locally-made, too, of wood and fiber. ASSAM AIR BASE - Another glowing chapter was added to the story of the Medical Corps in the C.B.I. 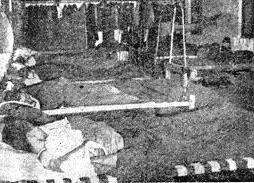 Theater when a private, suffering from acute appendicitis, was carried from the wilds of the Naga Hills and operated on with inadequate facilities amidst a torrential downpour. The chain of events was initiated when a group headquarters in Assam received a radiogram that Pvt. Edgar Murrah was suffering from an appendicitis attack and was to be carried from his station for treatment. Immediately, a return message was sent. The instructions were to bring Murrah to the bungalow of James Erskine, situated 25 miles away, and await arrival of the medical officer, Capt. Michael R. Mazzei, who would proceed from group headquarters 100 miles distant. An ambulance and a jeep started the trip, but the ambulance was forced to turn back when the trail became impassable. The party - Mazzei, T/3 Claude A. Arney, T/4 Fred J. Brown, T/4 George Buhle and T/5 Delbart Hamilton - piled into the rugged little jeep. Despite a flat tire and the start of a downpour, they reached the Erskine home. There was no word of Murrah and the Nagas carrying him down the trail. By this time a thundering rain storm was drenching the hills, so the jeep started up the trail toward the stricken man. Once the engine failed and had to be repaired. Twice, despite the skill of Buhle, the car slipped off the dangerous, treacherous trail and its occupants were forced to jump to safety. 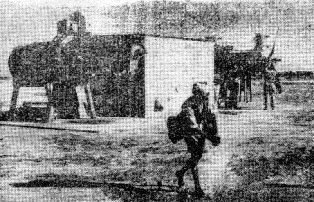 Finally, after ploughing through the mud and rain for 15 miles and reaching an elevation of 6,000 feet, the party met Murrah, carried by S/Sgt. Allen, Corp. Kelly, Pvts. Wyan, Howlett, Rusch and Carter and several Nagas. Drenched and tired after a tedious trip back along the muddy trail, the party reached the Erskine home at 3:30 a.m.
BACK ON THE JOB Capt. Jesse Carney, 14th Air Force fighter pilot, gets back in the cockpit of a P-40, ready for more action after being captured by the Japanese in Burma. Carney eluded the Japs and rejoined his buddies at an advance air base in China. 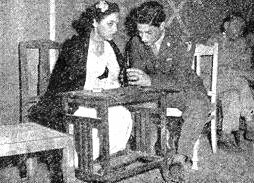 Mazzei decided at 8 a.m. that an operation was necessary and, aided by Brown and Arney, removed the inflamed appendix, with the operating table consisting of a litter, supported on both ends by chairs. To add to the complications of the return, Buhle developed severe malaria. After a few days of well-deserved rest, the party made its way back to group headquarters, where Murrah and Buhle had an uneventful convalescence. A Distinguished Flying Cross, a Silver Star and 37 Air Medals were the awards announced this week by the 10th Air Force. The D.F.C. was presented to Col. Homer L. Sanders, guiding genius of an Assam fighter group who often took to the air himself in combat action. He is now en route home to Houston, Tex., and reassignment. S/Sgt. Ray A. Lent was awarded the Silver Star as the result of heroic action over Rangoon on a bombing mission. A bullet tore and mangled one of his hands and shrapnel penetrated his other forearm, but he remained at his post until the enemy took flight. Then he went to the aid of his fellow gunner, who was badly hurt. Brig. Gen. Caleb V. Haynes, commanding general of the India Air Task Force, headed the list of those awarded the Air Medal. INDIA AIR DEPOT - As I sit here at my desk, looking out upon the world through the door, I'm wondering if the dust clouds will envelop us, or if the overhanging clouds will bring forth much-needed rain. Corresponding with out habitual life in the States and its weather conditions, India has only three seasons: Summer, Winter, and Monsoon - Hot, Dust, and Rain. I assume no other country, outside of Oklahoma, has India beat when it comes to dust storms, but then, too, Oklahoma is compensated with the fact that only the province of Texas in in the affected area. Did you ever read what Mark Twain said nearly 55 years ago in regard to the weather of India? - "They only speak of the weather in India as a conventional term of conversation. The only difference between summer and winter in India is that in the summer it's hot enough to melt a brass door knob - and in the winter, it's only hot enough to make it mushy." But seriously, even though we are in India, we can still profit from experience: - take for instance the dress of the Indian, who purposely forgets his trousers and parades the streets at the greatest of ease and comfort, wearing only the brightest of blue and white under-shorts, polo shirt and turban. Ah. the thought of the complete ease which life is accomplished here in India, gives one a feeling of greater life. Wouldn't you hate to be in the turmoil of the busy metropolis of civilization at a time like the present? (nevermind, I know what you are thinking!) - but the difference in our present status of living compared to the life we led before, is so radically different that we can well be proud of ourselves for the splendid way with which we have carried on. AMPHIBIOUS MIDGET JEEP PUTS TO SEA The Army's newest amphibious vehicle is the sea-jeep, which is seen (left) plunging into an ice-clogged river for tests. The jeep is also seen cutting through the ice. Tests found the sea-jeep to be as versatile and rugged in the water as on land. A power-driven winch on the bow enables it to pull itself up the steepest banks after a cable is attached on shore. The War Department announced a new guidebook, "Jungle and Desert Emergencies," telling fliers forced down in such regions, how to survive. The Army Air Forces Office of Safety Education prepared the book after extensive research into jungle and desert conditions, for inclusion in pilots' bailout kits. The book has an easy-to-find red cover of water-resistant paper and insect-repellant powder in its binding and glue. 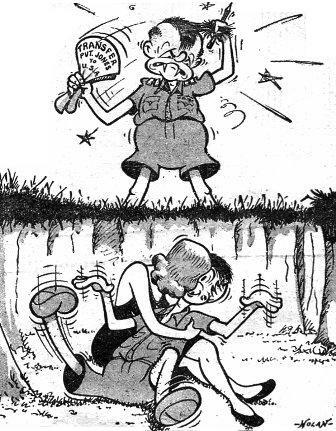 The book says that a man can live for weeks in the jungle if he avoids panic. Good food and water are available. In seeking water, it should be remembered that almost all animals travel towards the water at dawn and at dusk. The water must be purified. If one cannot find water, stems, lianas and large rattans contain a water substitute. The book says that in emergencies, termites are edible raw, after the wings have been removed. One must fry, boil or day a beetle before consuming. NEW YORK - The American aircraft industry this year is employing over 10,000,000 workers, or 20 times the number employed when the Germans invaded Poland, Tom Girdler, Board Chairman of the Consolidated-Vultee Aircraft Corporation, revealed here. "We are already turning out more planes than all our enemies combined and we are making them more powerful," Mr. Girdler said. "While the unit production of planes is being doubled, the horsepower of the engines is tripled and the tonnage quadrupled. "A given number of workers is turning out more planes than formerly. In building Consolidated Liberators, for example, we have cut the man-hours required per ship be two-thirds in less than a year." My heart wanders back to the one I love. I long for the girl that I left behind. But we must avenge the attack of the 7th of December. To try to blot out the "rising sun." And stand at attention to the "Star Spangled Banner." Proud that our land is free of strife. INDIA AIR BASE - Although still wondering about the fate of the columns which never appeared in the CBI, this correspondent herewith takes another whack at the writing game (with serious misgivings, however). Corp. Joseph Kirkwood, erstwhile St. Louis attorney, has been the most congratulated man in the squadron ever since the news came that an application for a direct commission in the Judge Advocate General's department, (made back in J. B. days) had been approved in Washington. As might be expected, the brass hats in the nation's capitol were not yet aware of the fact that Kirkwood was serving overseas as instructions contained ordered him to report to the hospital at J. B. for physical examination. He has, however, undergone a similar medical once-over here and the only thing now standing in the was of a first lieutenant's bars is approval of the board which okays such applications in this theater. Pfc. John Thomas Walsh, mail orderly and right popular guy when he hands each member of the squadron at least two dozen letters at every mail call, is the latest victim of the hoary "snipe hunt" hoax. Hailing from the Bronx, Walsh probably can't be held responsible, but it is a fact, nevertheless, that three conspirators, Sgt. Harry Hager, Corp. Bob Mason and Pfc. Elwood Simpson, had him running all over the camp area one night with a big gunny sack in quest of the exceedingly elusive and legendary little snips. Just to prove that he has a sense of humor, Pvt. Earl Lehman, the squadron's expert projectionist, flashes on the screen occasionally at our outdoor movies, this laugh-provoking plug: "What are you doing to help win the war? Buy U.S. War Bonds and Stamps." Lovers of swimming at this air base will not have to do without this spring and summer. It was welcome news when Maj. James A. Philpott, commanding officer, announced at a recent formation that a kindly English gentleman and his wife living nearby had made available to members of the squadron the use of their private "swimming pool." It's not too elaborate, it is true, but after all this is India. The pool is complete with diving board, raft, and best of all, has a complete change of water daily. Suppose you've heard by now of Gordon Bombach getting his envelopes mixed, with the result that a letter intended for his girlfriend went to his mother and vice versa. Speaking of the femmes, Corp. Walter Block must be the Casanova of them all. He made such an impression on a gal in California in the month he knew her that she's written him something like 120 letters in the half year he's been overseas. Can anyone top that? Lest we forget - sight of the week - Sgt. Leo Levine on KP. AUSTRALIA - The tasks which are being performed by the U.S. Army Air Transport Command are "something nobody would believe unless he had been reading Jules Verne," Maj. Gen. Harold L. George, chief of the command, told the press. George, who has just returned from an inspection trip to the New Guinea combat area, declared that during February - the heaviest month to date for the delivery of aircraft - the Air Transport Command's plane losses en route were only four one-hundredths of one percent of the planes flown. 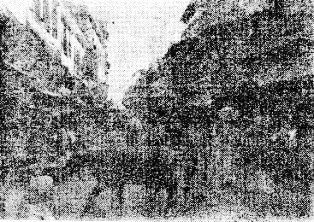 This figure represented a decline of three one-hundredths of one percent from the best previous month. George emphasized that this record was achieved in spite of the fact that planes are operating delivery routes from Florida across the South Atlantic to Africa, with branches to Cairo, Russia and Chungking; from Maine through Labrador and Greenland to Britain; across Canada to Alaska; from San Francisco to Honolulu and down the chain of Pacific islands to Australia. He declared that not one single plane had been lost as a result of enemy action on the long Pacific ferry route, "although there have been attempts to interfere." SO - YOU WANT TO GO HOME ! So - you want to go home! And you have heard a lot of rumors about rotation of officers and fat defense jobs for enlisted men over 38. A lot of you doubtless have your bags all packed. It's the greatest thing that ever happened. Well, gents, here's the dope straight from the horse's mouth. An officer may be rotated after one year in the theater provided NO replacement is required. The exception is when an officer is ill, wounded or undesirable. Even though the Air Corps has a policy of pilot rotation after a certain amount of combat duty it doesn't mean a thing because, again, the same policy on replacements prevails. "The enlisted man will NOT be released from duty overseas unless a suitable trained replacement is PRESENT AND AVAILABLE." however, the Roundup herewith offers hints on how Utopia may be reached despite current policy. Perpetually riding the sick book is always dangerous because your croaker may get board and a bored croaker won't even paint your posterior blisters (assuming you're a staff officer). On top of that he's apt to recommend a change of climate that might take you in entirely the wrong direction. The questions of wounds is a thorny one. The old gag of shooting off the trigger finger is only valid here for a clerk who types exclusively with the index finger of each hand. Shooting yourself through the hand almost always leaves incriminating powder burns and is messy at the best. There just ain't no percentage! A neat amputation of the left leg would be helpful in getting home. Don't amputate, however, if you tend to faint at the sight of blood. Making yourself undesirable is one of the best ways to at least get transferred. If your commanding officer has found some neat little girl, step in and beat his time. The result will either be a ticket home, a transfer to another situation or a long period of hard luck. Other methods which tend to bring the same results as mentioned above might be to muss your commanding officer's hair early each morning, the administration of a neat goose to the CO at the wrong time - especially when he is taking some general around on inspection; criticizing the CO's tactical and administrative judgment for the benefit of large audiences, and spitting water through your teeth during meals. On the other hand you might just as well unpack your bags and continue sweating it out here!